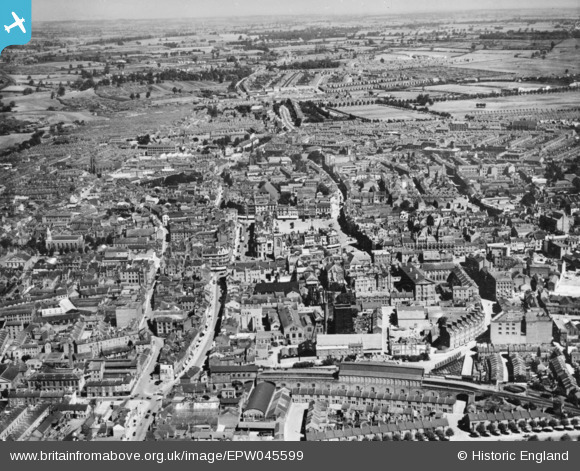 The photographs in the Britain from Above collection are great if you are hunting for long-vanished railway stations. Have a look at the bottom of this 1934 short of Northampton town centre and you will see a railway station. The station was a large elegant building of a light sandy-coloured limestone was constructed above street level on red brick arches with retaining walls which carried the line above Cattle Market Road as it meandered southwards past Northampton Cattle Market and then across the River Nene. An imposing train shed covered the central part of the two platforms. Northampton St. John's Street was the northern terminus of the Midland Railway's line from Bedford between 1872 and 1939. It was closed as a cost-cutting measure by the London, Midland and Scottish Railway and its services were diverted services to Northampton Castle, which is the town's station that remains open today.